I recently took a trip to the island of Grenada, which is located in the southeastern Caribbean. It was a great vacation, and I was particularly impressed by the bus system on the island, both because it was surprisingly efficient, and because it was entirely unlike the public transit that I know of in the United States. The bus system in Grenada was not particularly difficult to figure out, but there does not appear to be much information on it available online. Since using a public transportation system for the first time can be a confusing experience, I thought it would be helpful to provide some thoughts on using buses in Grenada. In my opinion, the main reason for taking a bus in Grenada is efficiency. 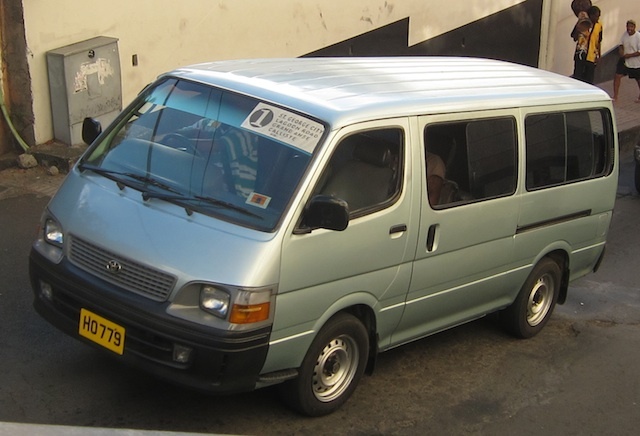 Unlike buses in the United States, which show up once every ten to thirty minutes, buses in Grenada show up several times a minute. In a thirty second walk I took down the Carenage, at least five #1 buses passed me going toward the bus terminal. Thus, there is practically no wait to catch a bus. Additionally, the bus drivers tend to be experienced at driving, so they drive just as fast as (or even faster than) other traffic. By no means am I an expert on Grenadian buses. I have made a total of two round trips on them, both on the same bus line. Additionally, I have some information about the buses from a travel guide book. Although I expect that my experiences are generalizable and probably even apply to bus lines other than the one I used, I cannot be sure of this. This page appears to have more information (and perhaps more accurate information) on the buses. They look practically like every other car on the road, and they often feel like teenagers’ vehicles, with loud music and bumper stickers—one bus I rode on even had a miniature disco light inside. Thus, the first time you get into a bus, it doesn’t feel like riding a bus at all! But there are several features that distinguish buses from other, similar cars on the road. The sticker with the bus line number on the windshield. In the picture above, the sticker indicates that this is a #1 bus. Note that many bus drivers appear to like to decorate the windshield with other stickers or logos, and many of the bus line stickers are old and faded, making them hard to read. The license plate starts with the letter H. Only buses and taxis have license plates starting with the letter H, and taxis usually have the word “TAXI” written on the windshield. Incidentally, it appears that license plates of personally-owned cars start with the letter P, government cars have plates starting with G, and trucks have plates starting with T.
The bus conductor or driver is probably yelling at you. The bus will usually have a driver on the right side of the car, and a conductor on the left side in the second row. If they see you on the street, one of them will yell out to ask if you want to take the bus. There are also designated bus stops, which are usually wood structures on the side of the road. However, chances are a bus will find you before you reach the stop. Note that the buses do not indicate whether they are headed to or from St. George’s, so unless you know the direction, it is worthwhile asking the destination. Within St. George’s, all buses depart from the main bus terminal. There, simply find a bus for the appropriate route. A bus will generally wait until it is full before departing, so try to find a full bus. The buses generally have a conductor who sits in the second row of seats in the bus. The conductor collects fares and also is the one you inform when you want to get off. On one bus that I took, however, there was no conductor, and the driver collected fares. When you get onto the bus, the conductor will tell you where to sit. I think that the bus conductors try to seat the tourists near the front, to make it easy for the tourists to signal when to stop. This may mean that you will sit in the front row, which can accommodate two passengers in addition to the driver. When departing from St. George’s, the conductor will probably collect the fare before the bus leaves the terminal. Otherwise, you can pay the conductor the fare at any point before (or while) leaving the bus. The conductor can probably make change for you, so there is no need to bring exact change for the fare. To get off the bus, I generally just told the conductor to let me off when the bus was near the station. I have read that you can also knock on the side of the vehicle to signal a stop request.